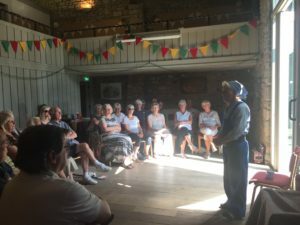 What a smashing turn out to hear and see Kate Saffin and Heather Wastie part of Alarum Theatre perform the roles of Idle Women. 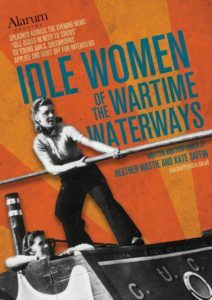 Of course they weren’t idle at all and neither were the Idle Women in the title, this myth grew after Susan Wolfit wrote the book ‘Idle Women’ about the life of women working on the inland waterways during the war. The whole scheme of women taking over the running of cargo boats on the waterways was apparently down to the influence and efforts of Daphne March who was checked out by a Minister of Transport after she advertised for people to help run this scheme of ‘national importance’. As the scheme got under way women were trained up, three journeys to Birmingham, two girls at a time was thought sufficient training. Conditions on the boats in those days were very basic, plumbing on boats didn’t exist then. The privy consisted of a basic bucket and a watering can and according to one user, left imprints on the nether regions. There was a rota for bathing, except in emergencies which occurred when someone fell in the canal. When it was hot people jumped in the canal to cool off, regardless of the slops that were thrown overboard. Sleeping arrangements were top to toe, with someone’s head in the cupboard. Sometimes girls had to sleep with coal grime on their pillow, proper baths where they could get a ‘Soak and Soap for 6d’ were rare. 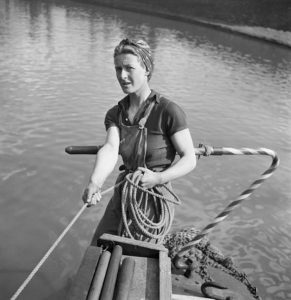 Girls borrowed their brothers and fathers clothing as it was more suited to tasks related to boating which included: steering, hooking, tugging, keeping abreast, easing, as well as all the skills needed for entering a lock. And according to Mr Carter’s Billy, you didn’t need letters (behind your name) on a boat. It wasn’t all la di dah, you had to be willing to learn. Amongst the stories were tales of walking the boat through the tunnels with their feet, lying on their back and singing ‘Onward Christian Soldiers’. Cargoes included coal, sugar, cotton and flour. The work was incessant and for twenty fours hours of the clock at times. Girls even forgot what it was like to dance! Memories included having a hand on the tiller and the aroma of the stock pot rising. Its easy to imagine this and the calmness of gliding along the relatively quiet canal on a still spring or autumn day. Three women of note were the aforementioned Daphne March, Emma Smith who wrote Maidens’ Trip and Nancy Smith (Ridgeway) who wrote Wide Barges. Of course there were many more women of note and some were included in Heathers musical performance including Miss Cicily Ramsay. Miranda, Ruth and Edith Bythesea. At the end of their watery sojourn all boats were handed back to the men ship shape and neat as pins. This was a very enjoyable afternoon, live theatre, poetry, singing and musical accompaniment and audience participation. We will have to think of a new role for our Barbara after her reprise! And we wish Kate and Heather every success with the continuation of their tour and their new venture next year.